LEFT: Model of the Portman Hotel. 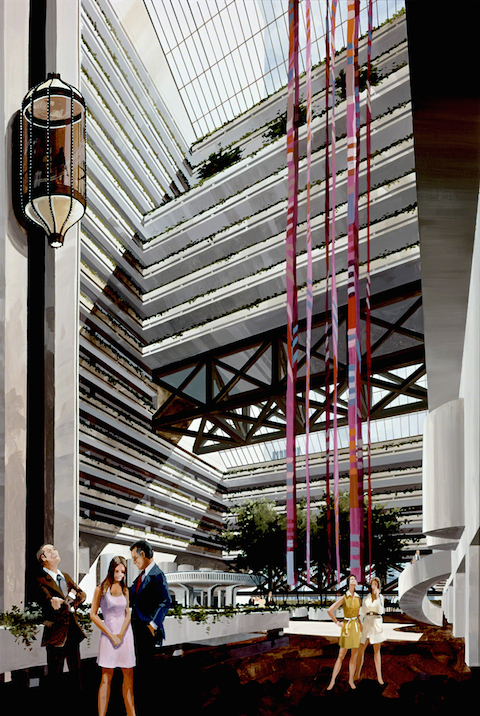 RIGHT:Rendering of the hotel's enclosed atrium. 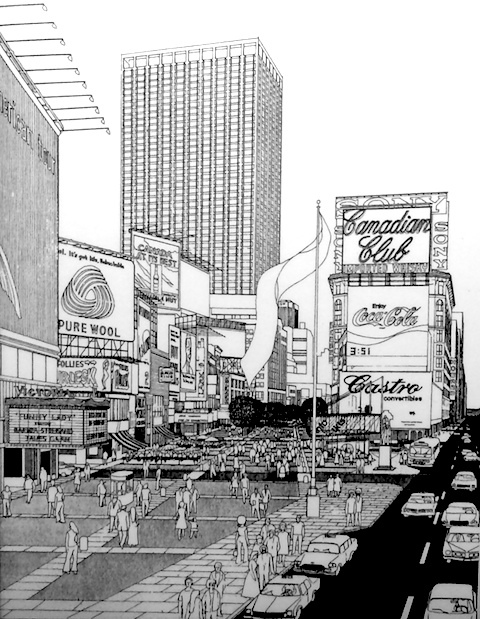 One of the major urban renewal projects of the 1970s planned for Times Square was the "Portman Hotel," which was announced with great fanfare by Mayor John Lindsay in July 1973. Atlanta architect John Portman had successfully competed to become both the designer and developer of the massive 2,000-room hotel on the full block of Broadway between 45th and 46th Streets. Like other contemporary Portman projects in Atlanta, Los Angeles, and Detroit, the hotel was a modernist design inwardly oriented around a full-height atrium space. 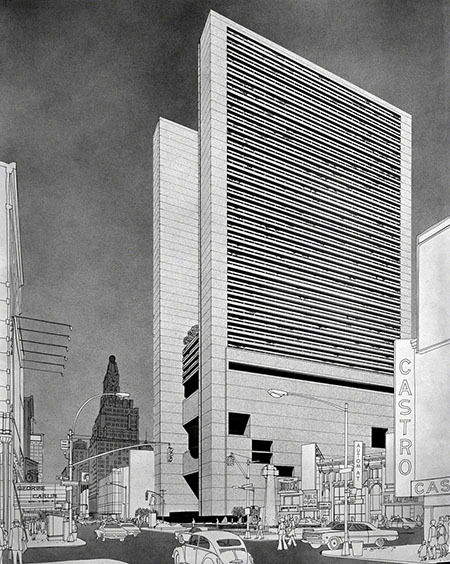 The site was the same one that in 1970 had been proposed for a mixed-use high-rise with a slab-shaped office tower designed by Emery Roth for the developer Peter Jay Sharp, shown in the rendering on the rear wall. A theater was planned for the lower level of the tower. In an effort to enliven the project visually, Sharp hired Venturi, Rauch, and Scott Brown to design the theater entrances. LEFT: Mixed-use office tower and theater for developer Peter J. 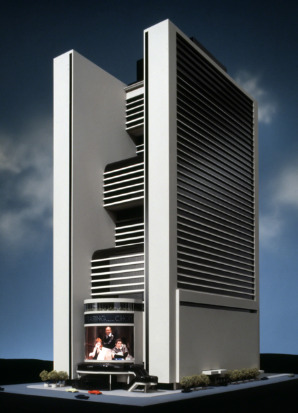 Sharp designed by Emery Roth, 1970. 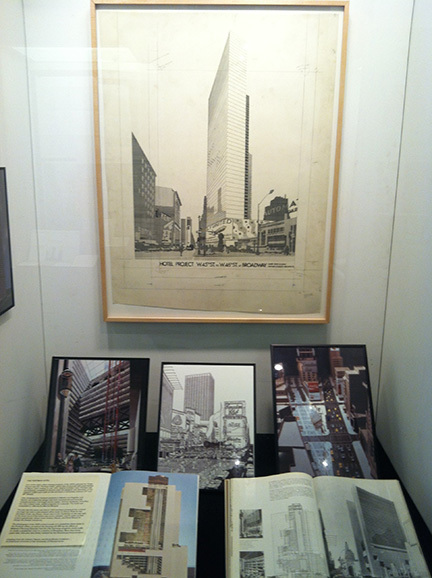 From the Venturi, Rauch, Scott Brown Collection of the Architectural Archives of the University of Pennsylvania. The City had long sought to create a pedestrian zone on this section of Broadway. 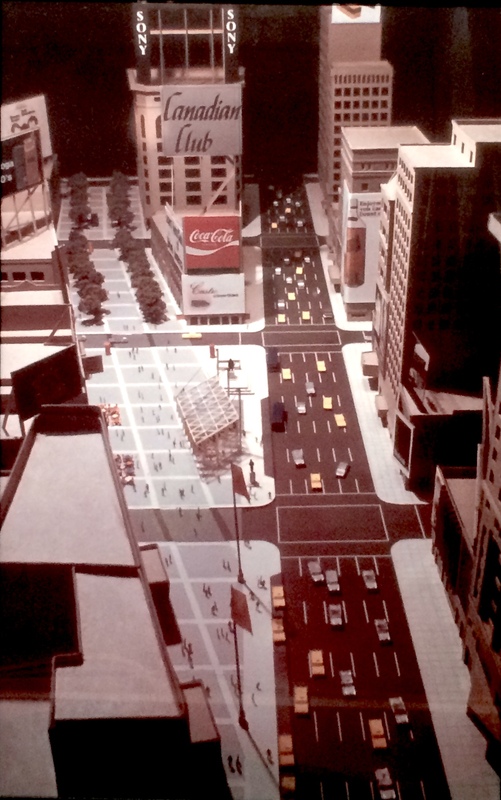 The 1978 context model made in the Portman office, as well as the drawing of 1981 by the Office of Midtown Planning, illustrate that goal, which more than thirty years later was finally realized by the Bloomberg Administration. Various obstacles, including the City's fiscal crisis, stalled the Portman Hotel's progress for a decade, and it was finally completed until 1985 as the Marriott Marquis. The long held goal of creating a public plaza within the bowtie of Times Square began under Mayor Lindsay in the early 1970s. 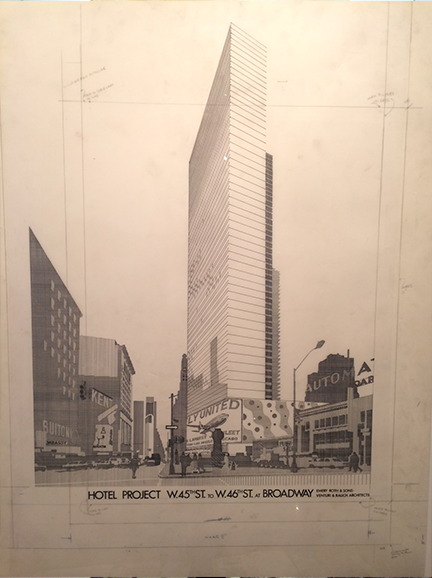 This idea for Broadway Plaza gained momentum in 1973 with the plans for the Portman Hotel on Broadway between 45th and 46th Streets. The city used this development to advance their plans for urban renewal, combining the Portman design with an extended pedestrian walkway beginning at 45th Street and running up Broadway. In the late 1970s, the development of the Portman Hotel was seen as a linchpin in the city's greater efforts to revitalize Times Square. The hotel's entrance would utilize the pedestrian-only area with an extended plaza. Capitalizing on the hotel's momentum, the city applied for $4.5 million in grants to support Broadway Plaza on the heel's of Portman's appeal for $21.5 million of federal funding. Though Broadway Plaza had political support, it struggled initially to gain public favor amid fears of increased traffic on Seventh Avenue and the disruption of a quintessentially New York avenue. New Yorkers were also concerned that the new plaza would become a hotspot for drug dealers. An editorial in The New York Times published in 1977 speculated that the plaza would be "nice pimp and prostitute promenade." By the spring of 1982, the Broadway Plaza project was all but abandoned as public attention was focused most strongly on preventing the demolition of two historic theaters, the Helen Hayes and the Morosco, which would result from the construction of the Portman Hotel. After the dust settled, however, only the plan for the Portman Hotel would come to fruition. Thirty years later, the vision of the Broadway Plaza is finally being realized. Beginning in 2009, the Bloomberg administration made efforts to transform Times Square into a lively pedestrian walkway. The initial, temporary, painted asphalt that demarcated the new plaza is currently being converted into a permanent public space under the vision of the design firm Sn�hetta.